To start our new season #DropThree is having a caption this contest! The top three responses will win 2 tickets to any Drop Three show! So start your snarky engines! Join MDSCA, BARCS and Bella’s Bully Buddies on August 4, 2013 as they Ride For Animals and enter to win four tickets to any* Drop Three Improv and Sketch Comedy show! *ALL proceeds will support the Maryland SPCA. *Valid toward Drop Three Sketch & Improv Comedy Performances Only. Not valid toward gift card purchase. Not valid toward special priced shows. Leave a comment Posted in Uncategorized Tagged barcs, bella's bully buddies, D3, drop three, mdspca, pitbull lovers unite! Drop Three’s To Do List! Ronald Burr and Belle Burr are ready to party with Drop 3! Drop Three’s Summer Double Feature! Spring has sprung and now summer is bursting at the seams with promises of hot sun, cold beer, and of course the coolest sketch and improv comedy in town. In fact, we have so much fun planned for you that we had to schedule two shows just to to contain it all. Saturday May 18th AND Friday June 7th will be filled to the brim with enough laughs to cool the most overheated brow with ease. Both shows are at 8pm (doors open at 7:30pm) and both will have special guests to give you two times the entertainment. Tickets are just $10. Purchase tickets online, call 410-752-1225 or email tickets@spotlighters.org. 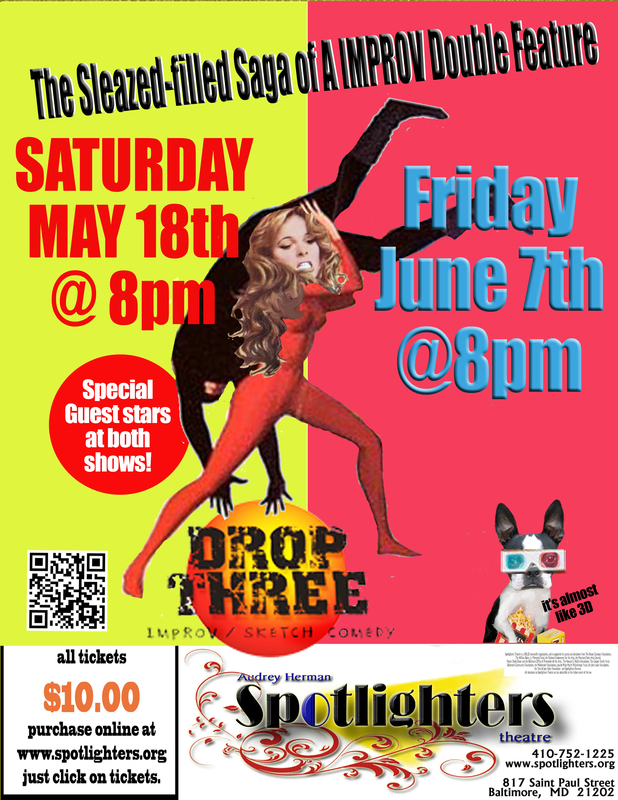 Drop Three is Baltimore’s premiere sketch and improv comedy troupe, combining equal parts Saturday Night Live and Whose Line Is It Anyway into a show that is completely original and interactive every time the cast steps on the stage. Check us out at www.dropthree.com. Join Drop Three on May 18, 2013 and June 7, 2013. Tickets are just $10. Doors open at 7:30pm, shows starts at 8pm. Allow time for parking. Leave a comment Posted in Uncategorized Tagged comedy, D3, drop three, improv, sketch, summer 2013, theater, we're back baby!